Automatic, labor saving equipment: several machines can be operated by one person. Cycle: Rapid approach --> Tool feed --> Rapid return. The cycle can adjust the flow control valve to set the speed fo tool feed. 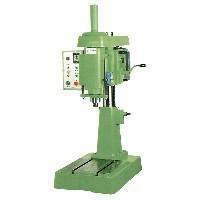 All machine are available for Multi-Spindle Head that will increase efficiency in 5-10 times. Hydraulic equipment with stronger thrust is suitable for large hole working.